Generally only those people who actually visit museums are able to enjoy the expositions. However, modern technology enables us to cross that line and open the door with valuable knowledge also to those who cannot visit museums in person. 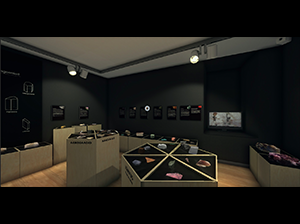 An excellent example is the virtual version of the exhibition „The Minerals“ at the Estonian Museum of Natural History. The objective was to document the entire exhibition in the most lifelike manner and therefore we transported practically the whole physical exhibition into a virtual environment. In this format it is accessible to everyone with an Internet connection. The digital environment provides various opportunities for sharing information, which enables to increase and diversify the information presented to the viewer. Thus, the exhibition becomes a learning environment.